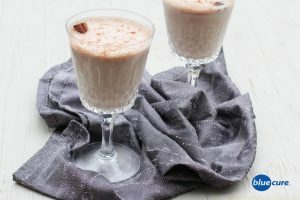 Lighten up the holiday season with this plant-based version of eggnog. It’s egg free, and uses cashews as the base ingredient. It’s light, delicious, and has a chai tea taste to it. Enjoy it warm or cold for a tasty holiday or winter treat. In a high speed blender, blend all the ingredients together until smooth. Pour into glass and serve with ice. To heat the eggnog, pour the cashew milk into a sauce pan and heat on medium-low heat. Stir often to avoid burning. Then transfer to cups and enjoy!